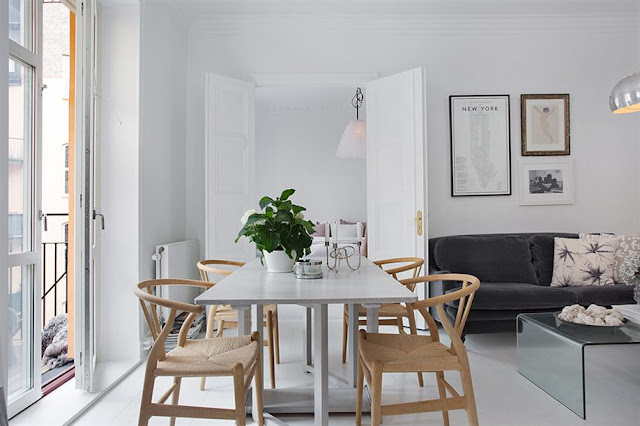 For sale right now in the beautiful, smart district of Östermalm in Stockholm is this light, bright and airy apartment decorated in white and grey with a dusty pink accent. I love how the wishbone chairs make a focal point. So envious of the all white floors. What would be your absolute dream floor? 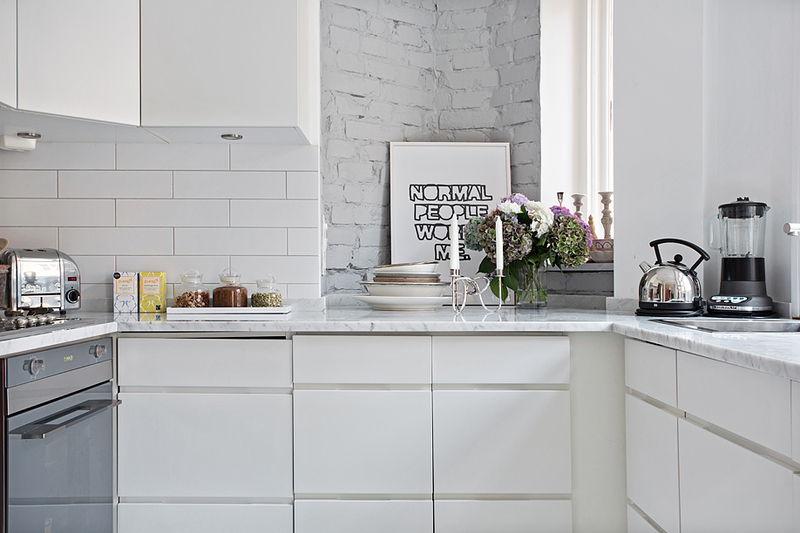 I think the print in the kitchen is by one of my favourite Swedish typographers, Therese Sennerholt however, I can't find it on her website - am I wrong (could I be...no way!? haha!). I am always on the look out for great black and white prints, a current favourite is this one. On the subject of black and white....don't forget to enter my give-away if you haven't already (sorry to bang on about this, I just don't want anyone to miss out!). Ah, perfect. Not sure how I missed that! Thank you! Such a lovely and cosy home! Dream floors... maybe hardwood floors, or bamboo floor (beucause it's more ecological). We're thinking of getting bamboo wood decking on our patio, I love the look and feel of it! 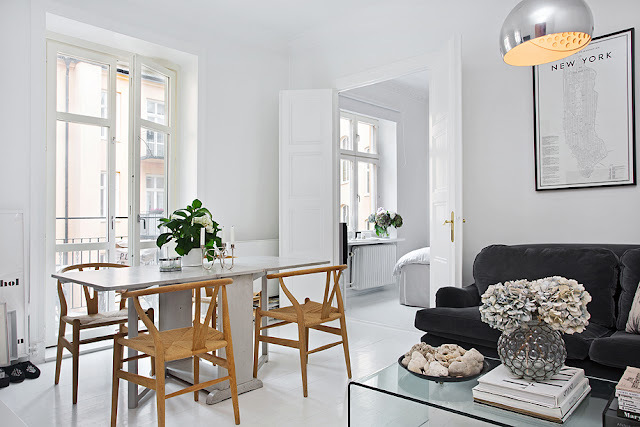 Those floors are so beautiful but how can you maintain a white floor neat all the time? Perfect combination! 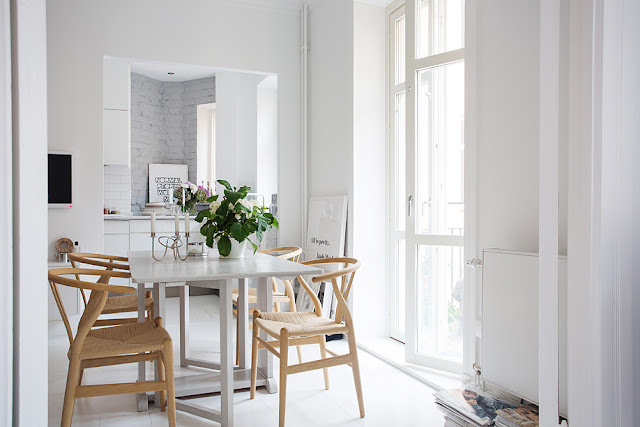 The kind of home interior I've been longing for. Every area is fantastic, so lovely and cozy! You did a great job accessorizing that room! I love those little topiaries you used. I agree that the accessories are what give the room life!